Autumn is a big season for sports. From Friday night lights to fall ball, there’s plenty of kicking, batting, and tackling to keep every sports fans busy well into the winter! If you play sports regularly, you’re no doubt already familiar with the upcoming schedule, and you may be worried about being stuck on the sidelines during orthodontic treatment with braces. We treat many athletic patients here at Kaplan Orthodontics, and while this is a very common concern, it’s also an unfounded one. Wearing braces won’t keep you from being active, and you’ll be able to continue participating in any athletics you’re involved in at school or in the community while you straighten your smile. Just look at all the pros who have undergone orthodontic treatment without taking any time off – from Dwight Howard and Cristiano Ronaldo to Venus Williams and Brett Favre, being in braces never slowed them down! While you won’t have to hang your jersey up any time soon, you will need to be careful to keep your braces and mouth safe. This is especially true if you play contact sports, where there is an increased risk of damaging your orthodontic appliance, or injuring your teeth or mouth. Sports-related injuries to the mouth and jaw are some of the most common injuries incurred by athletes, and while they are rarely life-threatening, they can still be painful, cause serious damage, and be costly to fix. We’ve seen many of these injuries up close and personal, including lacerations to the cheeks, lips, and tongue, chipped or broken teeth, dislocation of the temporomandibular joint (TMJ), and even root fractures. When you’re wearing a fixed orthodontic appliance like braces, it adds a whole new element to these types of injuries. Braces can cut the inside of your mouth during a collision, causing lacerations, and the braces themselves can suffer damage, including bent wires and broken brackets. The #1 most effective way to protect your teeth, mouth, and braces while playing sports is by wearing a mouthguard. Kaplan Orthodontics will generally recommend our braces patients wear an orthodontic mouthguard, but even a basic model will help prevent things like bleeding gums, broken brackets, or potentially fractured teeth. This is especially true for those who play sports that include contact, such as football, wrestling, soccer, basketball, and hockey. Mouthguards are an easily available, affordable option for athletes looking to prevent damage and injury from occurring during practice or games. Although they are especially useful for high-contact sports, we recommend wearing them for light contact or low-impact sports, too. Even a small amount of pressure on your braces can irritate the inside of your mouth, or cause small cuts or abrasions to your gums and cheeks. If you know you’re going to be active and regularly participate in sports while wearing braces, we suggest you look into investing in an orthodontic mouthguard. Because they are made from a high-grade silicone, your lips are cushioned if they are bumped against your teeth and braces. This will also protect the brackets from any impact-related damage, and stop your lip getting caught in your braces, which is exactly as painful as it sounds! Orthodontic mouthguards do tend to run just slightly larger than most non-orthodontic mouthguards, but the silicone makes them just as comfortable to wear. Some orthodontic mouthguards, such as the Shock Doctor and Tapout brands, will adjust to the movement of your teeth during treatment. This simply means they will re-mold to them multiple times as their position changes over the course of the orthodontic process. 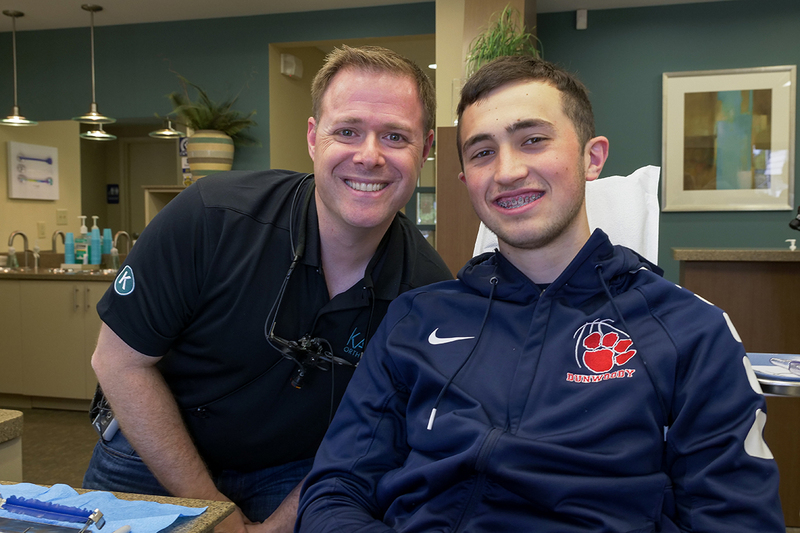 Because they adjust based on your current bite, they are great for any athletes undergoing orthodontic treatment, and even younger athletes without any orthodontic appliances. We strongly recommend that any of our sports-playing braces patients consider having an orthodontic mouthguard to keep their teeth and mouth protected. They are generally available at most major sporting goods stores, but Dr. Kaplan is also happy to recommend or order one for you based on your specific needs. As you can see, mouthguards are a worthwhile investment for braces patients who play sports. They shield your teeth as they move into their new permanent positions, and protect the actual orthodontic process itself. While an orthodontic mouthguard is optimal, wearing any mouthguard over not wearing one at all when participating in athletics is preferable. Whether you choose to wear a mouthguard during physical activity or not, you should plan to get in touch with your general dentist’s office as soon as possible if you receive an injury to your teeth. Your dentist will be able to diagnose if you have any root or jaw bone fractures that need immediate attention. If you are wearing braces, contact us after your dentist treated any tooth damage so Dr. Kaplan can assess your braces for any replacement or repair needs as well. If you are currently undergoing orthodontic treatment with us and wondering what braces will mean for your sports schedule this fall, we’re happy to set your mind at ease! Our skilled staff is committed to helping you continue playing the sports you love while straightening your smile and protecting your teeth and braces. Dr. Kaplan and the rest of our team work hard to give you the most rewarding, stress-free orthodontic experience possible, so if you have any questions or concerns about your treatment, please get in touch. We’re always happy to talk through any issues with you. With an orthodontic mouthguard protecting your braces and smile, and the support of Kaplan Orthodontic behind you, you can rest assured that you’re on the right track to a brighter, healthier, more beautifully aligned smile!